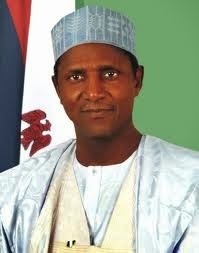 Nigerian Biography: Biography of Umaru Musa Yar'adua; Ex-President; Politician; Katsina State Celebrity. Biography of Umaru Musa Yar'adua; Ex-President; Politician; Katsina State Celebrity. School in the year 1962. Umaru Musa Yar’Adua had his secondary education at Government College Keffi between the years 1965 and 1969. After his secondary education, Umaru Musa Yar’Adua attended Ahmadu Bello University, Zaria between 1972 and 1975 where he obtained B. Sc., in Education and Chemistry. In 1978, he obtained his M.Sc., in Analytical Chemistry from his Alma Mater. Yar'Adua worked as a teacher at Holy Child College in Lagos between the years 1975 and 1976. Later, he became a lecturer at the College of Arts, Science, and Technology Zaria between 1976 and 1979. Yar'Adua worked with the following organizations/companies: Sambo Farms Ltd in Funtua, Katsina State, Katsina State Farmers' Supply Company, Katsina College of Arts, Science and Technology Zaria, Katsina Polytechnic, Katsina State Investment and Property Development Company (KIPDECO), Habib Nigeria Bank Ltd, Lodigiani Nigeria Ltd, Hamada Holdings, Madara Ltd, Vom, Jos, and Nation House Press Ltd, Kaduna. In the year 1999, Umaru Musa Yar’Adua contested for the position of the governor of Katsina State and won. He was re-elected in the year 2003 for a second term. In April 2007, he contested for the position of the president of the Federal Republic of Nigeria and won. On November 23, 2009, Umaru Musa Yar’Adua became very ill and was flown overseas to Saudi-Arabia. He was reported to be receiving treatment for pericarditis. His said treatment prolonged that he was not seen in public again creating a power vacuum in the seat of the presidency. On January 22, 2010, the Supreme Court of Nigeria passed a ruling, charging the Federal Executive Council (FEC) to within fourteen days, decide whether Umaru Musa Yar’Adua was capable of discharging the functions of his office. On February 9, 2010, the Senate as a matter of necessity, transferred Presidential Powers to Vice President Goodluck Jonathan, and have him declared the Acting President of the Federal Republic of Nigeria, with all the powers of the president, pending the return of Umaru Musa Yar’Adua in full health. On May 5, 2010, Umaru Musa Yar’Adua died and was buried on May 6, in his hometown. Umaru Musa Yar'Adua is married Turai Umaru Yar'Adua and they had seven children (five daughters and two sons). Their daughter Zainab got married to Usman Saidu Nasamu Dakingari, a one time governor of Kebbi State. Another daughter of theirs' Nafisat is married to Isa Yuguda, The Governor of Bauchi State. Yar'Adua also married Hauwa Umar Radda as a second wife. Their marriage was blessed with two children.